BEO Play’s company ethos leaps off the page when you read about them; ‘We’re in the business of goosebumps.’ With such a bold statement the good news is that they’ll need to back that up with exceptional products. Building on the 90 year heritage of Bang & Olufsen the range is the perfect combination of design and functionality for incredible sound wherever you are, as embodied in their latest, the B&O PLAY 2 personal, portable bluetooth speaker. The beautiful pebble shape is splash and dust resistant, and beneath the pearl blasted aluminium and real leather case is a cunning combination of top-end technology, white magic and love. 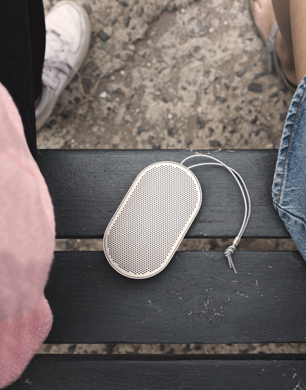 That means that you can tap on the anodised aluminium grill to play or pause music, and shake to skip tracks, which can be customised with the Beoplay App. There’s even a microphone for taking calls to add to 360-degree sound dispersion, so everywhere sounds the same. I can think of no better way to ensure goosebumps when the bassline thumps, and that is perfectly portable, and Covetable.